Problem D17: An ideal gas starts out initially at a volume V0 and a temperature T0. 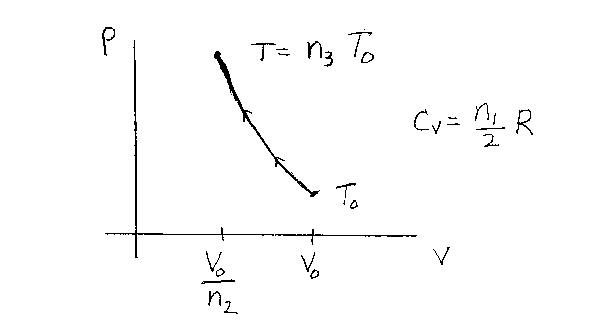 It is then compressed adiabatically to a volume V0/n2. The molar heat capacity of the gas for a constant volume process is CV = n1R/2 for the temperatures in this problem. If the final temperature of the gas is T=n3T0, what is n3? Note that n1, n2 and n3 are unitless. Note that n1=3 for a monatomic gas, 5 for a diatomic gas, and 7 for a polyatomic gas in the temperature region of the problem. R is the gas constant.